Configure your Apple iPhone or iPad with your Suddenlink.net email account, so you can check your email on your mobile device. 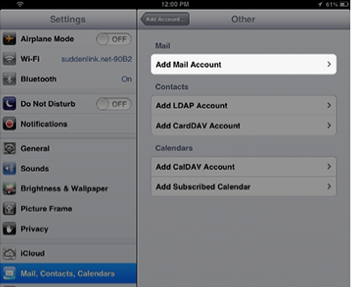 Tap "Mail, Contacts, Calendars" in the Setting screen. Tap "Add Account" then "Add Mail Account". Tap "Other" on the Add Account screen. Enter your information on the New Account screen and tap "Next." The information you entered will be verified and if the credentials are correct, your Suddenlink email account will be configured. Your new mail account will be listed under Accounts in the Mail, Contacts, Calendars screen. Tap your new account name to ensure the following settings are correct under the Incoming and Outgoing Mail Server sections.